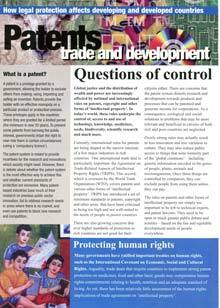 DISCUSSION PAPERS - there were written for trade negotiators and policy makers responsible for analysing and assessing the impact of intellectual property on particular sectors. Examines ethical, economic, environmental and social issues related to food security, biodiversity and the TRIPS Agreement. Outlines policy issues surrounding the protection of Traditional Knowledge in TRIPS and other international fora. Examines history of and legal options available under sui generis systems in TRIPS for plant variety protection, in particular UPOV, Indian and Namibian approaches, and their likely impact on farming communities. Discusses biotechnology and the minimum standards of intellectual property rights required of Members of the World Trade Organisation and affects on food security. ISSUE PAPERS - in these authors examine a subject of importance to the development of the international intellectual property regime. The topics were selected following consultations with negotiators from developing countries. Provides an overview, based on intellectual property rights negotiations in the Americas, of some of the implications of regional and bilateral TRIPS plus agreements for the current minimum standards under TRIPS. Analyses the special and differential treatment provisions in the TRIPS Agreement, assesses their implementation in support of development, and makes 10 recommendations for change. Sisule Musungu & Graham Dutfield, December 2003. Discusses TRIPS-plus standards at the multilateral level particularly in WIPO, negotiations at WIPO, its mandate in relation to UN development goals, and its role in harmonising patent law standards. Contributes to a better understanding of TRIPS plus issues as found in the FTA and the lessons that can be drawn from the negotiations between the most powerful and technologically advanced country in the world and a small but dynamic developing country with an open and liberal economy. Focuses on how the mandates and competencies of key UN institutions relevant to innovation, development and intellectual property can be brought to bear in addressing the challenges of the 21st century knowledge society. OCCASIONAL PAPERS - are normally written by individuals who participated in QUNO and QIAP dialogues. These papers build upon the author's presentation at a dialogue. Margaret Llwewlyn & Mike Adcock, November 2000. Discusses common goals, a practical approach, the life cycle of a drug, an IP decision tree for access to drugs, differential pricing, and national legislation under TRIPS. 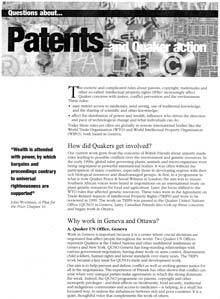 Discusses patents in practice, who benefits, the difference between invention and innovation, who uses patents and effects of strengthening the system, especially on the weak, and the costs of patents through illusion and distortion. Examines the subjects of disputes, relationship between TRIPS and GATT, principles of interpretation, object and purpose of TRIPS, interpreting domestic law, discrimination vs differentiation, interpretative approaches, and impending cases. Discusses public involvement in R&D, efficiency, medicines for the poor, patent protection in developing countries, and patents and innovation. Warns that non-violation and article 64.3 of TRISP should not be overlooked and explains why. Discusses the purposes of DoO, national and international precedents, the scope of an obligation and discharging it, and the issues arising in TRIPS. 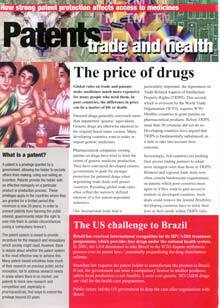 Examines contradictory trends to those achieved in the Doha Declaration on TRIPS and Public Health, particularly in CAFTA and the Morocco and Australia FTAs. Graham Dutfield and Uma Suthersanen, August 2004. Discusses harmonisation in a dynamic historical context, the issues at stake, experiences from business history in Germany, Switzerland, India, Japan and the Asian Tigers, the USA and their implications. Examines developing countries objectives and justifications for a DoO, practical issues, consistency with TRIPS and coherence in different negotiating fora. 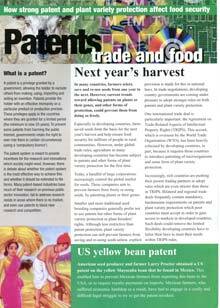 Discusses current trends and status, the history of access to plant genetic resources for food and agriculture, role of intellectual property and the threat that patents pose. Reflects on three versions of declaration of origin - voluntary, mandatory and proof of legal acquisition - discusses what difference disclosure of origin in patent application would have made to hoodia, neem, enola bean and rosy periwinkle cases and compatibility with the TRIPS Agreement. These four-page, downloadable, background papers provide an introduction to intellectual property issues, particularly around patents, for the general, non-specialised reader.